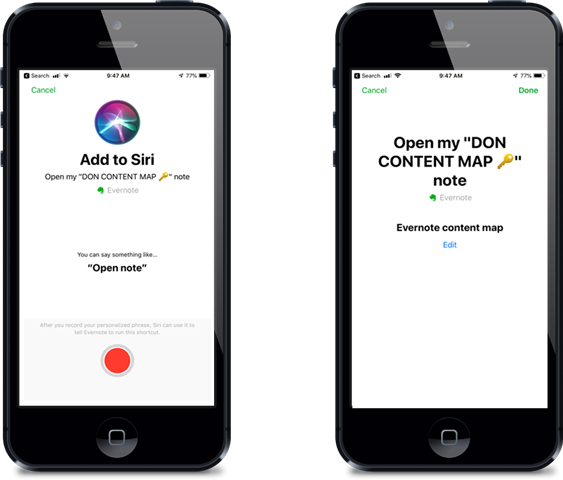 Evernote and Siri Shortcuts = Gamechanger! I didn’t think this would be a big deal — I was wrong! iOS 12 introduced the Shortcuts App for iPhone and iPad. 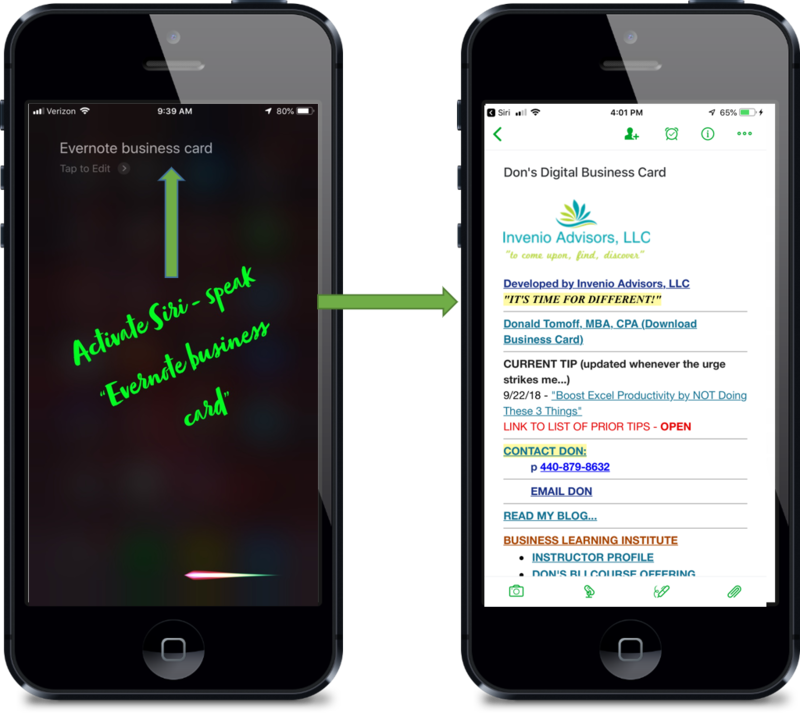 One of my favorite productivity apps is Evernote note-taking. 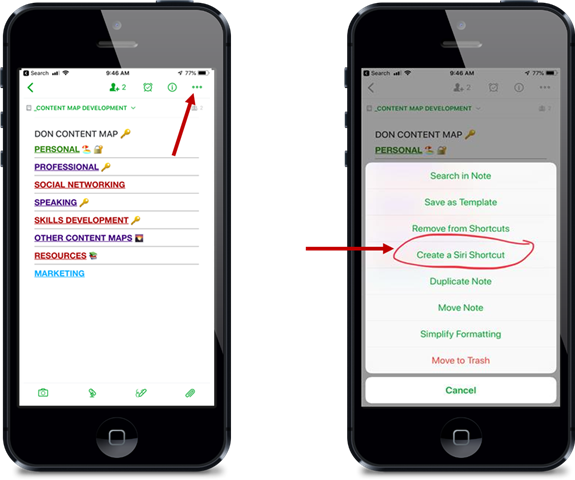 Having voice access to notes, saved searches, specific tags, etc. is a productivity boost that you can’t really imagine until you set them up! Opens my digital resource card of all my professional info linked — easy sharing. Opens Evernote with just notes I created today displayed. Opens my note where I maintain immediate pending items. I look at this daily. Opens Evernote showing just notes tagged with a specific client code. Multiple versions of this — Client 1, 2, 3, etc. This is a “Table of Contents” note that I use to “launch” me to different content that I maintain and need frequent access to. Opens notes tagged with DonDoThis! (one of my favorite tags for articles, videos, or any miscellaneous content that I want to come back to). 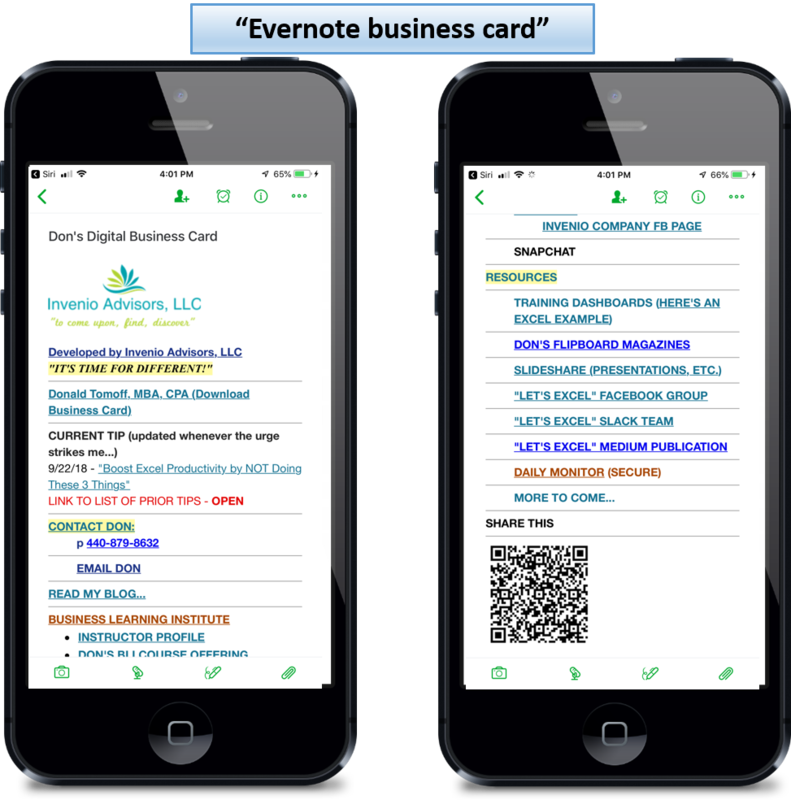 Access Evernote note, search, etc. that you want shortcut for. Access “Create a Siri Shortcut”. Record phrase. Make sure it’s the phrase you wanted. Done. You can also come back and edit it at anytime. Record Phrase — Your Done. The Shortcut is now active! My focus above is on Evernote, but other apps have this capability also. Here is an article that highlights other apps that have Siri shortcuts functionality. I would love to hear what your favorite Siri shortcuts are. Let me know in the comments below. Don is passionate about helping professionals and organizations keep up, develop and adapt to the changing business world that we operate in. This story is published in The Startup, Medium’s largest entrepreneurship publication followed by + 376,225 people.